Texas counties: Scurry, Lubbock, and Donley. 5 from Lake J.B. Thomas (Scurry Co) caught on 20-III-1997. A sixth was given to Ed Knudson also from Lake J.B. Thomas caught on 20-III-1997. Oklahoma: Also recorded from Cimarron County, OK, collected May 12, 1984 in Black Mesa SP by Chuck Harp. Flight Period: Late March through mid May. Note: Holland (1903) wrote that "this beautiful insect ... is still very rare in collections." Similar Species: Eupseudomorpha is a monotypic genus. Holland, W.J. 1903. The Moth Book: A Popular Guide to a Knowledge of the Moths of North America. Doubleday, Page, & Co., N.Y. xxiv + 479 pp. Poole, R.W. 1989. Noctuidae. 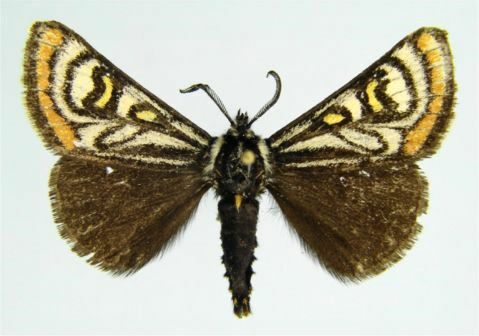 Lepidopterorum catalogus (New Series), Fascicle 124: 1314 pp in 3 parts. Knudson, E. & C. Bordelon. 2003. Illustrated Checklist of the Lepidoptera of Texas, Publication 6. Texas Lepidoptera Survey, Houston. (12 color plates not in other regional checklists).